Truth be told, I was really walking a knife’s edge on Day Four, the day that I blogged about last year (around the same time) on Chuck’s blog: The Diamond Conspiracy was out in the wild and reaching the hands of readers. I will be like this for the next few months probably. When the book goes live, though, you don’t know what the reaction will be; and books sometimes go through a slow burn, and keeping that momentum up on a new title when other books are entering the market can be a full-time occupation. So no, releasing a new book never gets old, even when you think I should have all the confidence in the world from previous titles. Phoenix Rising and The Janus Affair still appear in Amazon’s Top 100 in Steampunk, and Dawn’s Early Light is being honored with the RT Reviewers’ Choice Award for “Best Steampunk of 2014.” The fourth season of our award-winning Tales from the Archives is underway, and tweets are coming in from all points of the world asking if there’s another Books & Braun adventure in the works. 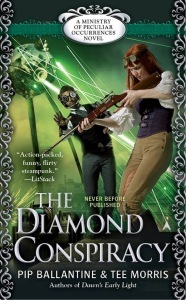 If I don’t reply straight away, it’s because I’m working on the next novel, not at all worried about how The Diamond Conspiracy is performing. Nope. It never gets old. Take a deep breath… screw it. Have a beer. Light a cigar with your second beer. It will be OK. Really.